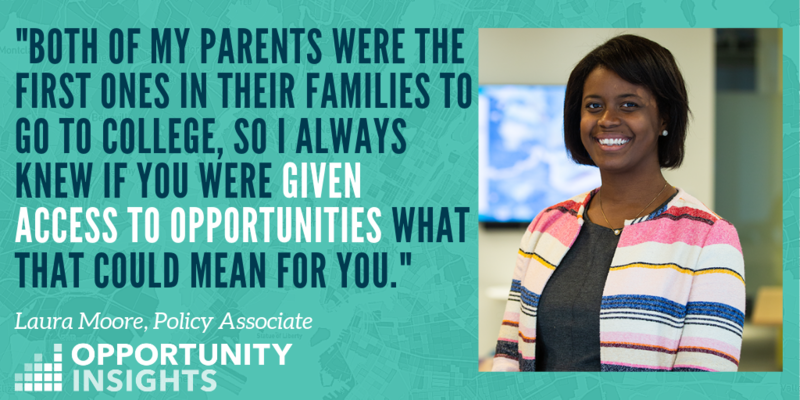 When Opportunity Insights Policy Associate Laura Moore was growing up in Memphis, the city had two systems of public education. The city school system that largely served poor and minority students and the county school system that served primarily white and middle-class students, who were more likely to graduate from high school and go on to college. Moore grew up in a family of educators. Her mother works as the executive director of exceptional children and health services for Shelby County Schools, beginning her career as a teacher, school-level administrator, and principal. Her father served as an assistant dean at the University of Tennessee Health Science Center and spent more than three decades working to improve the access and success for minority students in medical school before his death in 2010. She graduated from high school in 2005 and went to Harvard, majoring in social studies. As a freshman, she joined the Harvard Crimson, where her interest in education led her to revive the long-dormant Cambridge Public Schools beat. She eventually received her Master of Public Policy, with a focus on education policy, from Vanderbilt University. Today, Moore’s policy portfolio at Opportunity Insights includes work on education access for Collegiate Leaders in Increasing MoBility (CLIMB), a partnership between researchers and colleges to improve upward mobility and increase higher education access for low-income students. Moore ended up at Opportunity Insights thanks to a colleague’s last-minute cancellation from a conference. During the conference, she heard Opportunity Insights co-founder Raj Chetty speak about his plans to link his research data with policy work in communities across the country. Moore recalls sitting in the audience in late 2017 when Chetty delivered the remarks about this novel idea. At the time, she was working as senior educator advisor to the mayor of Nashville. “At the conference, Raj talked about getting down to Census-tract level with the data. I understood immediately how transformative this could be for local policy work,” Moore said. Seven months into the job now, Moore says there are about 15 cities she and her team will be working in this year to test locally-tailored policy interventions. Specific areas of focus include housing, higher education, and racial disparities. “This will be the year where we turn the corner from just explaining the research to starting real work on the ground and being able to say this has an impact or this doesn’t have an impact,” Moore said. Before coming to Boston to work with Opportunity Insights at Harvard, Moore spent most of her post-collegiate career back in her home state of Tennessee. After beginning her career in Washington, D.C. after college, she moved to Nashville. This return to her home state is where Moore saw the tangible impact of working on local policy. As a result, she believes strongly in the power of a local community’s role in identifying their unique challenges and creating change.